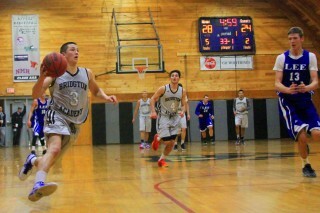 Bridgton Academy’s Basketball has a rich tradition, with four NEPSAC AAA championships and countless Division I careers under its belt, as well as several NBA and other pro league careers. Since 1997 Coach Whit Lesure (a New England Basketball Hall-of-Famer) has built a program that has prided itself on creating college-ready student athletes who can step on a college campus and make an impact. Bridgton Academy has helped recruit dozens of players to Division I schools, including Kansas University, the University of Kentucky, Ohio University, Georgia State, Missouri State, the University of Houston, St. John’s University and St. Louis University. We also have a long history of students playing and studying at Connecticut College, Wesleyan, and other NESCAC schools, as well as Bentley University and other outstanding schools. • Schedule against college competition WITHOUT the loss of a year of NCAA eligibility. Competition against the highest level prep schools in the country, as well as U.S. Service Academy prep schools. • Year-round strength and conditioning program with certified instructors.